Christmas. Many people seem to be happily living and singing, “It’s the most wonderful time of the year”. And yet, others are not singing at all. They are doing their best to get through the day or the next minute as they persevere through suffering, loneliness, heartbreak, financial problems, health issues, relationship drama, death of a loved one and the hurt-list goes on and on. Is there something about the message of Christmas that can give us hope? Gary sharing/signing the Christmas story with our sons Rex (6) and Luke (2). Christmas 1982. What is Christmas about anyway? Before I continue…I want to pray for you and me. Our Father, I ask the Holy Spirit to help us hear the CHRISTmas story this season as though we are hearing Your Love Story for the very first time. Reveal to us the glorious Good News of Your Indescribable Gift! Revive our hearts, souls, minds, and spirits restoring to us our first love for You and refocusing our lives on what really matters for eternity. In the Name of Your Son and our Savior–Jesus–I pray. Amen. In the beginning the Triune God–Father, Son and Holy Spirit–created a majestic world for His masterpieces-Adam and Eve. God made Adam and Eve in His image. God is love and loved His masterpieces so much that He gave them a powerful gift-CHOICE. Adam and Eve would not be robots. In the beautiful world God created, He gave Adam and Eve the choice to eat from all the trees in the garden except from the tree of the knowledge of good and evil. If they chose to eat from THAT tree they would die. God and Adam and Eve walked together, talked together until…GASP…Adam and Eve did the unthinkable! They made the choice to eat from THAT tree and SIN AND DEATH entered the world. Their choice changed EVERYTHING from that day forward…BUT–NOT–FOR–FOREVER! Because God is omniscient–all knowing–before the foundation of the world God already knew what His masterpieces would choose to do. He created the world and Adam and Eve anyway! Surely God is love!!! God made a choice even before He breathed the breath of life into His masterpieces a TOO–GOOD–TO–BE–TRUE–CHOICE that would FORGIVE SIN AND ONE GLORIOUS ETERNAL DAY UNDO DEATH FOREVER! Surely God is love!!! Paul expresses it well, “Thanks be to God for His Indescribable Gift!” (2 Corinthians 9:15). The Son of God emptied Himself and became an embryo in the womb of a virgin named Mary; He was woven together–Son of God/Son of Man. O come let us adore Him. O come let us adore Him. O come let us adore Him. Christ the Lord! An angel of the Lord appeared in a dream to the man engaged to Mary, “Joseph, son of David, do not be afraid to embrace Mary as your wife, for the One conceived in her is from the Holy Spirit. She will give birth to a Son, and you shall give Him the name Jesus, because He will save His people from their sins” (Matthew 1:20). “And this is His commandment: We must believe in the Name of His Son, Jesus Christ, and love one another, just as He commanded us” (1 John 3:23). Is there something about Christmas that gives hope? YES! The amazing truth of the INDESCRIBABLE GIFT IS NOT ONLY CHRISTMAS–JESUS BIRTH BUT ALSO GOOD FRIDAY, RESURRECTION AND SECOND COMING! This broken, hurting world that we live in is not my forever home. And if Jesus is your Savior and Lord it’s not your forever home either. Some of my favorite Scriptures in the Bible are in Revelation, Chapter 21. I can sense the Heavenly Father’s love! Finally together! PAH! Can you sense His love?! May these God Words fill us with so much hope that it spills over into a river of joy flowing out of us! Look forward to the SECOND COMING! Let us share this Good News with others…especially our families. And let us pray our families embrace and believe the truth of God’s Love Story in the Holy Bible. 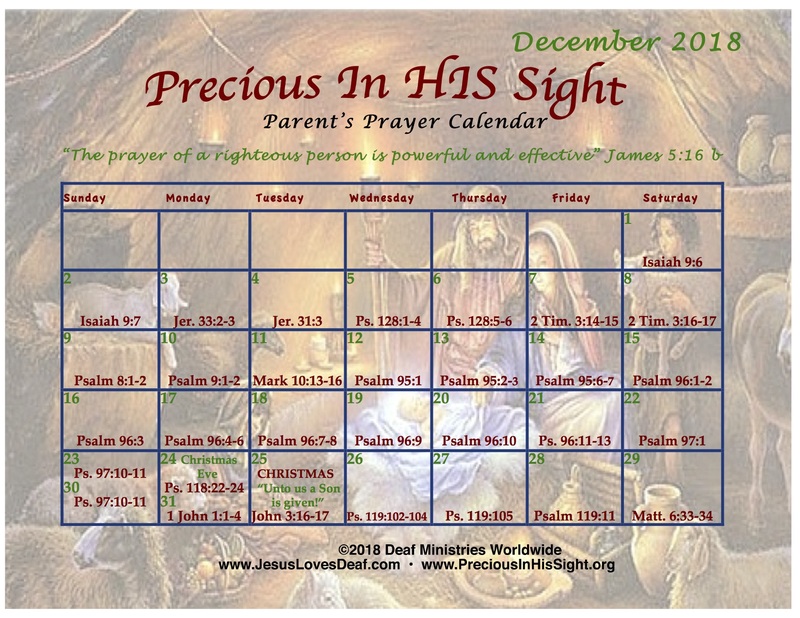 The Precious In HIS Sight Prayer Calendar has helped me faithfully pray for my loved ones through the years. Click on the Calendar and it opens, enlarged in a new window making it easy to read the Scripture references. Look up the Scripture reference for the day in your Bible, and turn the verse into a prayer for your loved ones. I print the Calendar and keep it in my Bible. I encourage you to do the same. I have found that Scripture Prayers are powerful! Always keep praying for your loved ones. God is listening, and with God nothing is impossible! “There is salvation in no one else! God has given no other name under heaven by which we must be saved” (Acts 4:12). I have many Christmas snowflake decorations. They are meaningful to me because of this verse. “Come now, let’s settle this,” says the LORD. “Though your sins are like scarlet, I will make them as white as snow” (Isaiah 1:18a). I am forgiven! Thank You, Lover of my soul! A BLESSED MERRY CHRISTMAS TO YOU AND YOUR FAMILY! Previous Post 65 and Still Alive! Beautiful Christmas Devotion. Very impressive. Thank you for December calendar. May the Lord bless your ministry in blog.